Long time, no posts… I Have been quite busy in the past days on some projects. One of them is Swappy Colors, a game that I developed while learned Unity 3D engine. Results can be seen here! As I mentioned some a couple of posts ago, I have been playing around with cloudbase.io and I got so excited with it that I decided to help them on one feature that I was missing. As a database-driven developer I always expect to have a sort of a tool where I can see the data on a tabular way, like the old SQL Query Analyzer (now Mgmt Studio) on MS SQL, or tools like PL/SQL Developer from oracle. That`s where I wanted to give my 2 cents to cloudbase. 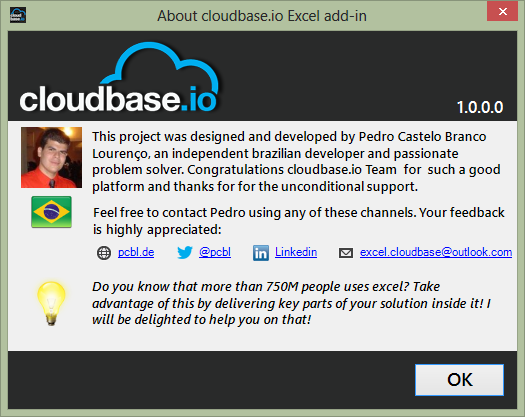 Based on some past experiences on MS Office plugins development, I came up with one idea to build one add-in to use Excel as a tool to analyze my cloudbase data. 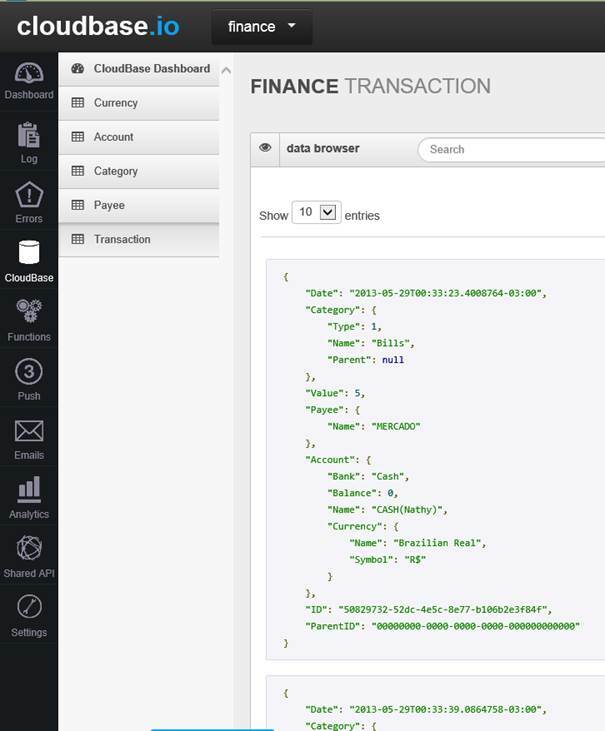 The beta version of the plugin was announced today by cloudbase team. Once you downloaded the lite edition for free from here, you will get a new tab inside your office(2007,2010 and 2013). The general idea is that by using the settings window you could add as many applications as you want to have. Once you have applications configured, you will be able to select them from the Excel ribbon, and for each application you will be able to get data from all collections! By using the Filter Pane you can define some more precise filter to avoid download massive amount of data. Another nice feature is the possibility to get cloudbase statistics data(same from the management portal) also straight to your excel! And last, but not least, there’s an extremely valuable feature which will allow you to do the next step regarding your data analysis. 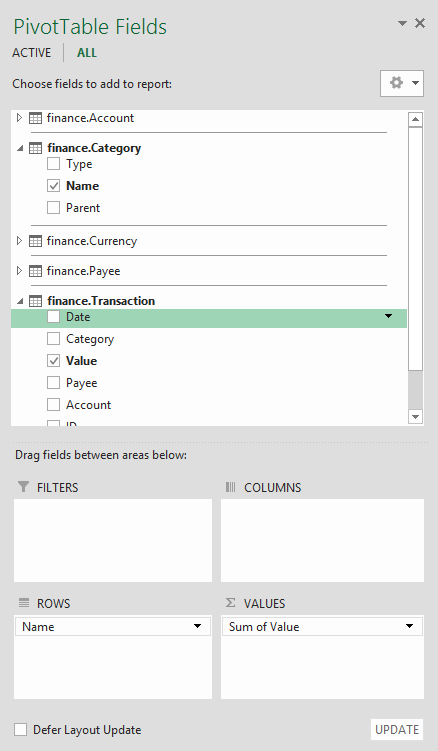 First of all, I must say it works only on Excel 2013… The feature is called Data Analysis and it will basically download the data from all collections of the current selected application, allowing you to make a pivot table with data from different application collections! This is really valuable! It allows this by using a new feature on excel 2013 called Data Model. If you still did not tried the plugin out, don’t lose this opportunity. A “Pro” version supporting data update as well is planned! Please let me know if you are interested on it! When I look to my daughter mind-blowing creativity I must agree 100% on what is mentioned above! Right now she is 8 years old and she is always developing models on how stuff works. On this light, after talking to a friend of mine I ended up on Scratch, which is an outstanding MIT Project to introduce children some computational logic in order to support them to be more prepared for the world! It emphasizes an very nice “Creative Computing” concept. The main target is not to create young programmers, but to introduce “core computational concepts”(loops, conditions,…) to them, allowing them to explore other areas backed up with a solid computational knowledge. Imagine if you could learn some key Math concepts and immediately use them on a sample project?! Great stuff MIT! Keep up the awesome work! Are you looking for a database on the cloud for your apps? Cloudbase is a great option! Then, finally I have found two new candidates: Cloudant and Cloudbase. Both services have a lot of similarities. Different than the traditional relational databases, they are NOSQL databases, which I need to do some deeper studies. They both were exactly what i was looking for!! I ended up taking cloudbase as the first steps tutorial were quite exciting and I could see first results with few minutes, accessing same data on Windows 8, windows Phone and iOS! That really excited me! I see a lot of potential on services like cloudbase because they really make it easy for developers to build much wider experiences across different technologies, delivering a much better user experience to the end-user. It is really a very nice service, which i strongly recommend you to take a look! 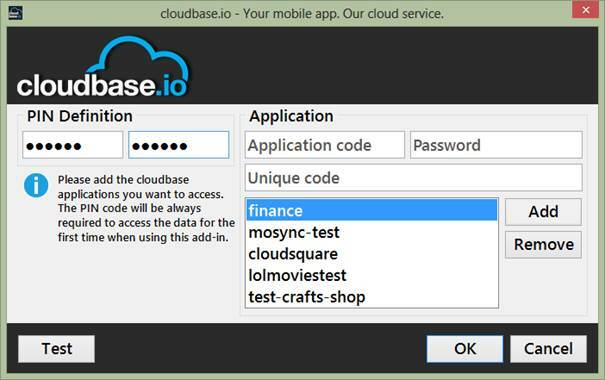 Right now I am working on a small project to help cloudbase developers… Quite soon I will be announcing it here. Meanwhile, worth take a look on cloudbase website! New Adventure: How to build a game in XNA without any knowledge about it?! As I said on my previous post, I decided to build one game in order to learn something different and also to keep myself trying the “Monetization path” for my Apps. I ended up making this tutorial from MSDN site… Really high quality material! If you wanna to learn something about XNA, you have to take this tutorial! This was a very nice Tutorial and it really helped me to do my first steps on the XNA world. Thanks Microsoft for that. Really good stuff! Create a “Competition” environment by creating a worldwide Leaderboard! The Game just got certified and very soon it will be available on the WP marketplace! Enjoy! More infos can be found here. A lot of work, but a lot of fun!!!! But I have some news! About a month and half ago I started to look for better the possibilities that I can get from Microsoft Advertising when it comes to “making money” with my WP apps. If you are not aware about that, I strongly encourage you to jump on this boat! A quite interesting feature is the Live Tile feature, which change it to a set of nice pictures and also keep the daily verse updated! By doing this App I realized it was time to make a bigger step and make a GAME!!! That’s where XNA came in! On the next post I will keep telling the news!! 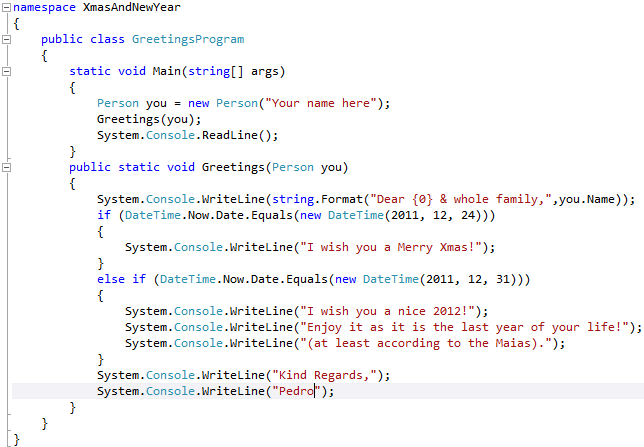 So you want to provide a DataSet to your WP7 app?! It is not new (wow, more than 2 years) that MS announced that there’s no plan to support dataset on Silverlight (currently WP7 is based on Silverlight 3 based). But we all know that life is not so easier and we cannot just change to LINQ to Entities. I’m not even going to jump in this discussion here. Actually I am assuming that you need an alternative. One possible alternative is the SilverlightDataset project, created by Laskarzhevsky Software Inc. I have to be honest that I did not used this solution mainly because at the first moment I’m trying to do something really simple. // or referenced by a test program. // Define the "get" accessor method for CustomerName. // Define the "set" accessor method for CustomerName. // their corresponding behaviors, "get" and "set" respectively. // Add any types to include here. Just to remember, AspNetCompatibilityRequirements is required by the Silverlight 3 Service client. 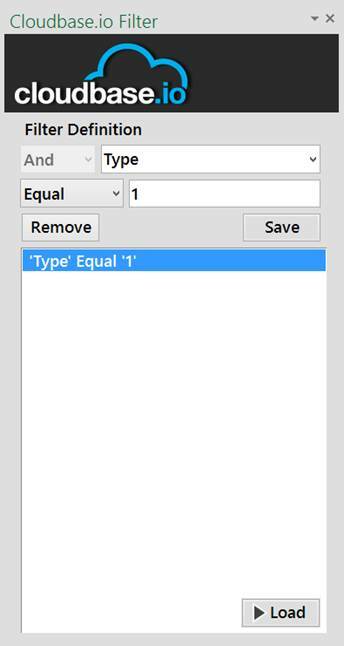 The GetKnownTypes method is doing the miracle to allow me to return dynamic types to my client. Actually when my client generates the proxy classes, the Students class will be available as well! Finally, you can see that the service is returning a created type based on a row with the values “Pedro” and 28. The most important thing to see is that our Students type was created, even if our main WebService API do not refer to it. Actually that GetKnownTypes made this “miracle”! Basically this code just call the method GetData from our service… Look that when the GetDataCompleted event we just cast the result to (DataSetService.Students) . Then we just show a messageBox… Really simple… And it worked nicely! DOWNLOAD: Naturally you can have the sourceCode of this sample here. I know I have been away! There are a set of reasons for that. But one thing that I can say is that I’m always taking some free time to play around with the development of TFS On the Road. Currently I’m working on the possibility to add attachments to Work items but I have found some “challenges”. Therefore I’m in contact with the TFS Odata Service guys trying to help them to simulate the issues that I’m having. I’m sure that we will have a solution to the issues that I’m finding. One big limitation that I see is that I cannot attach files bigger than 64kb at the current version of TFS Odata… So my plan was to allow the attachment of voice notes and this will be difficult with this limitation of 64 kb. But I’m still looking for possibilities. Besides that one of the next features is to support some basic WI edition. A lot of work to do, but I’m sure we will get there, step by step. As you can see, on average there’s about 9,9 downloads per day of the app since it was launch, number that I consider nice to a very specific niche application like this… 358 downloads so far. And growing! I have to say a big thank you especially to Brian Keller. He made a blog post that is up for almost a month! J This is really helping on my website traffic and app downloads. And to make things even better, yesterday Brian Harry also made one post where he mentioned TFS On The road as well! Thanks all my friends that tweeted, re-tweeted and posted something else about this app! Nice! The v1.5 of the TFS On The Road was just published to the Market Place. This new version holds the interesting feature that I showed on the post Improving TFS On The Road chart capabilities . Basically this feature will allow you to drill down on your work items through different levels. Let me show some pictures to explain better. Bellow you can see the stacked chart of WI types per State. Note that there’s a Settings Link up-right of the chart. When you click there you will see one screen to select some chart settings. 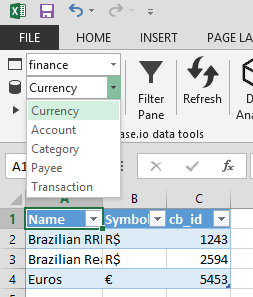 You can select between a set of chart types. Stacked charts supports two fields. As soon as I do this I will see the list of work items filtered by state=’Active’. Note that you have the option to show a chart for this Work items list as well. Just tap the Chart button(bottom right). First you will see the default chart(stacked by WI type/State). This time I will change to Pie by Iteration Path. Then I can immediately see all Active Wi’s by Iteration Path! Awesome! And you can take a look on the chart as well for this level (3rd level). It starts with the default chart… Of course you can change it as well. On the last level I Changed to show Bar charts by “Assigned to”. And Of Course I can move On!!!! I will click on the last bar to drill down again (pedro’s active tasks on the Iteration ‘Wave Twelve’)… Look the list and the applied Filter… And Of course you could drill down again! J But I think it’s deep enough on this sample. Theoretically you could drill down as much as you can. If you still did not got the 1.5 version… Just take it to play around with this feature!